Shutting Down Your Zephyr when you are finished running. Some users prefer to release all addresses active in their system before shutting down. This can prevent unexpected results when you power up the layout again. There are two ways to do this. 1. Press the LOCO key. 2. Enter the loco address on the numeric keypad. The display will flash the Function Indicator Dot and the loco address. Press the LOCO key again. 3. Set the Throttle Knob to STOP. 4. Press the EXIT key. 5. Repeat for all locos/addresses used in your session. 1. Press the PROG key. 2. Press the SWITCH key. The Switch Indicator Dot will blink to indicate you are in Option Switch configuration mode. 3. Enter 036. 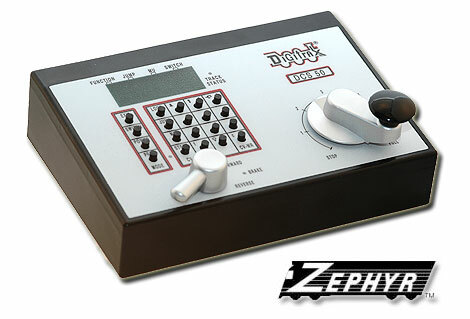 For the Zephyr Xtra DCS51 use 039 instead. 1. Press the Power Key to turn track power off. 2. Unplug the PS315 power supply from the wall.